When the weatherman tells you to take cover because a hurricane is on the way, it is important to have already taken all the necessary precautions. Taking precautionary efforts beforehand can yield big savings and peace of mind in the future. Check with your insurance agent to be sure that it reflects the current state of your home. It is important to consider adding flood insurance coverage for additional living expenses in the event your home is uninhabitable post storm. In regards to homeowners insurance, making a home inventory can save you time and make filing a claim much easier. To learn more about creating a home inventory, click here. Some tips for protecting your property include: Head and foot bolts on doors for added protection, a safe room to withstand high winds and debris, hurricane straps or clips to help hold the roof to the walls of your house, and hurricane shutters or plywood boards for each window. It is important to have an emergency supply kit ready with a 2 week supply of water and ready to eat non perishable food for every family member and pet. It is important to have an evacuation plan. If you do not currently have transportation of your own it is important to make arrangements with friends or family members. Do not take unnecessary risks such as running back into a destroyed home or refuse evacuation after you have been ordered to. Things can be replaced, people can’t. 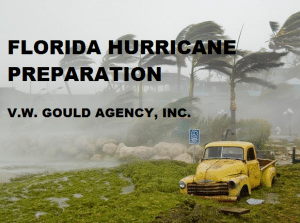 To learn more about Florida Hurricane Insurance, Click here. To speak with an agent in regards to your current homeowners insurance or flood insurance policy, call us today at (386) 734 3970.